It was a surreal experience on the first night of Chanukah. I attended a dinner with interfaith visitors from the kingdom of Bahrain. The delegation from this Gulf state was hosted by the Simon Wiesenthal Center. On the way to the restaurant at the Jerusalem Mamilla Mall, the Bahraini delegation passed the mall’s Chabad candle lighting festival. So many people were attending the festivities that the visitors were almost prevented from passing through. I was told that several delegates danced together with the Chabad representatives and bystanders. The Bahraini delegation included Sunni and Shiite Muslims, Hindus, Sikhs, Buddhists, and Christians. A Syrian Orthodox priest told me the originators of his church were Jews. The gathering started with Rabbi Abraham Cooper, the associate dean of the Simon Wiesenthal Center, lighting the first candle of Chanukah. He then passed the shamash, the lighting candle, to several Bahrainis who each touched the burning candle with it to participate in the lighting. This unofficial delegation visited religious and other sites in Israel, yet it was its presence here only came about because the authorities of the Arab kingdom did not oppose the visit. The king of Bahrain, Hamad bin Isa al Khalifa, had invited Rabbi Marvin Hier who heads the Wiesenthal Center, and Rabbi Cooper last February to visit him at the island’s capital, Manama. That meeting was not kept secret and even reported on local TV. Prince Nasser bin Hamad al Khalifa, son of the Bahraini king, came with a large delegation to the Wiesenthal Center’s headquarters in Los Angeles in September 2017. They also visited the center’s Museum of Tolerance and participated in a dinner attended by hundreds of interfaith leaders. When the Israeli national hymn, “Hatikvah,” was played, the prince and the delegation stood. Rabbi Hier told the Times of Israel that the king of Bahrain now opposed the Arab states’ boycott of Israel. The king also intended to allow citizens from his kingdom to visit Israel freely. There are still some Jews living in Manama, where there is a synagogue. According to a secret U.S. cable published by Wikileaks, the king had mentioned to an American official that Bahrain had contacts with Israeli intelligence. Al Jazeera published information about Palestinian and Bahraini opposition to the visit to Israel. It also mentioned that the Bahraini delegation had been refused entry into Gaza. A representative of the Wiesenthal Center declared that such a visit was never planned. During the dinner I sat next to a Buddhist monk from Thailand who lives in Bahrain. He had been a monk for 17 years. He is the head of the local community of Thai Buddhists. He didn’t partake in the dinner because he never eats after lunchtime. A Hindu gentleman opposite me also didn’t eat. He told me he fasts for more than 24 hours every 15 days. He is the sales and marketing manager of a Bahraini trading company. He explained that he started every day with two hours of prayer. 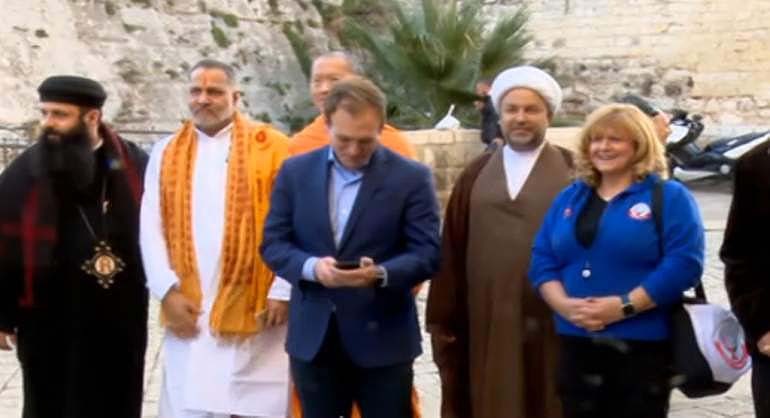 In Israel he visited a temple close to Ariel where there is a small Hindu community. Next to him sat the priest of his temple in Bahrain. The priest mentioned that out of the 350,000 Indians of various religions living in Bahrain, about 100,000 are Hindus. There are several Hindu temples in the country. On a festive day his temple is visited by up to 15,000 people. The man sitting next to him, a businessman, was the chairman of the temple. On my other side sat an American-born universalist living in a village in Mid Java, Indonesia. He said he considers himself a Muslim, Hindu, Buddhist, and Christian. He added that it was difficult to be a Jew. We agreed that unless one was born into the faith, a lot of education is required to become a Jew. Next to him sat the leader of the Bahraini delegation, Betsy Mathieson, who heads an organization called Sharing the Humble Bahraini Way of Life. It wasn’t exactly like in the time of the Maccabees, but I considered this dinner a small miracle taking place in Israel on the first day of Chanukah.